A BrightTalk Webinar aimed at mid-tier corporates, Family Offices and private clients. Of particular interest to CEOs, CIOs, CTOs and GRC functions. The webinar will discuss: the unique nature of the threat to mid-tier corporates and Family Offices; why you should be aware not alarmed; assessing your current cyber maturity; building strength in depth; the importance of leadership. 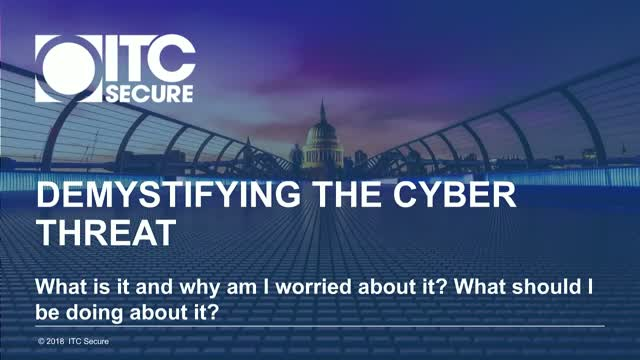 The webinar will enable those who currently see a threat they don’t understand and are alarmed by, to begin to take concrete steps to address it. Malcolm Taylor is the Director of Cyber Security at ITC Secure, the London-based, leading MSSP and Cyber Security Consultancy company. Malcolm is a recognised expert in strategic cyber security, built upon a 20+ year career at GCHQ and in the private sector. While Family Offices do rely extensively on the human touch to create and nurture relationships, technology can enable humans to do jobs that need to be done but still low-value. Indeed, this is becoming a selling point, but how can you know what tech is worth it vs. what tech is just fun to say you have? Further, what new business models exist that are driving value for clients? You'll leave this webinar with an understanding of what technology exists to streamline operations, cut your work in half, and make you physically able to work more effectively, and what new business models exist. This interview will feature Scott Freidheim, who served on the global executive committee of Lehman Brothers as Chief Administrative Officer. Scott has since been the CEO of a public company, sits on many corporate boards in the US and Europe, and is now managing partner Freidheim Capital. Scott will open up about what has been learned in the 10 years since Lehman Brothers went bankrupt, and offer suggestions in creating a better safety net than is currently in place. While are worse off, there are mechanisms that can exist to save main street. Scott will discuss suggestions on how companies can use crises to gain marketshare versus failing or even staying in the same place. Finally, we'll discuss how he, as someone who has weathered the Global Financial Crisis, the Euro Crisis, and as a general investor, maps his investment lens with his operator lens. As co founders of the impact investing movement, the GatherLab team has a unique perspective on its past and present…but also its future. In our presentation, When Impact is Not Enough, we focus on transformative capital for the emerging economy, one that faces huge human and financial risks from climate change to income inequality, from resource depletion to global health (both pandemics and “lifestyle" diseases.) But in those risks also lie significant opportunities. Transformative capital calls for a different lens on investing and notions of capital - but one that can pay huge dividends now and across generations, both financial and personal. This session is specifically designed for HNW individuals, investment managers and funds that are interested in social impact investment. Deal Flow remains an issue for family offices. Where can you find more investing ideas, and how do you filter the good from the bad? Do you have the right connections, and are you tapped into the right networks, to get deals that are seemingly only seen by Investment Banks? In this webinar KP Reddy will outline 7 considerations that Family Offices are taking to find new deals for investments, including Expertise, Alternatives & Equity Debt Hybrid models. In this interactive session Anirudh A Damani, Managing Partner, Artha Venture Fund I, will walk you through successful Investment Strategies & Asset Allocation. What is the investment objective? How (and why) investment objectives should drive allocation of assets? There will also a live Q&A round! Anirudh Damani is the Managing Partner of an early stage Investment Fund, Artha Venture Fund, based in India. He is a 4th generation entrepreneur who has invested in over 57 startups, participating in 100+ funding rounds of companies like Oyo Rooms, Exotel, CoutLoot, Tala and NowFloats. He graduated with a Double Major in Business Administration &amp; Economics from Austin College, Texas. People with savings want to earn a decent return without running too much risk. Some have saved out of their earnings, some have built up capital in a business which they sell, some have inherited some money. None of them want to throw it away. In an era of ultra-low interest rates just putting it in a bank means the value of your capital goes down each year, as prices are rising faster than the return on a deposit. That’s why many conclude they do need to take some more risk, to own some shares and bonds that offer a higher income but can also go down in value. Investment managers need to maximise return for a given level of risk, and need to construct portfolios so not everything goes down at the same time if things do go wrong. This talk will examine how you spread your risks, and argues that over the longer term buying a portfolio of shares usually delivers a return above inflation, with a rising income from increasing dividends. Managers also are able to choose from a range of different countries with different currencies for their shares, and to look at the opportunities in commercial property as well. That can help find the right mix of return and risks. This session is designed to appeal to ‘non-institution’ family investors and individuals interested in the Chinese tech venture space, or people who are aspired to learn more about the Chinese tech venture market, and strategic investment structures in general. Bridget Soul, Director – Olsson and Soul Capital. A discussion for the investor on the sector’s diverse range of agribusinesses and value propositions. Agricultural investment means more than just buying land. This session will cover an in depth review of a vertically integrated 'paddock to plate' supply chain investment opportunity and criteria. By Bridget Soul, Director – Olsson and Soul Capital. This interview will feature Scott Freidheim, who served on the global executive committe of Lehman Brothers as Chief Administrative Officer. Scott has since been the CEO of a public company, sits on many corporate boards in the US and Europe, and is now managing partner Freidheim Capital. Ziad speaks about geopolitics, investing, markets, trading & more.